Chinese New Year, also known as the Spring Festival (Chunjie 春节) is the most important and the most celebrated festival in China. It falls on the first day of the first month in the Chinese lunisolar calendar. Chinese New Year 2019 will start on February 5th. Traditionally, celebrations last for 15 days and end with the Lantern Festival celebrations which fall on February 19th this year. February 4-10, 2019 are non-working days. This means all the banks, offices, companies and factories are closed, as well as many shops, restaurants and service points. The Chinese visit their relatives, which often means traveling to regions far away from the place of their residence. This results in many difficulties regarding traveling across the country. Airports and railway stations are overcrowded and the tickets are sold out a month in advance. The prices of tickets and hotel rooms rise and tourist attractions are packed with people. Bear in mind that the Chinese New Year is called the largest annual mass human migration. Therefore, if you want to travel during this time, you need to plan your trip ahead of time. However, it’s not recommended to take a tourist trip to China during this time, let alone try to close business deals. Spring Festival is an opportunity for the Chinese to get rest from the work affairs so don’t expect your Chinese partner to participate in business dealings. The preparations for Chinese New Year begin one month in advance. The whole family joins in cleaning up the house in order to drive out all the evil spirits and misfortunes accumulated in the past year. It’s important to enter New Year with a clean slate. That is why the Chinese take care of paying off debts, resolving conflicts and closing unfinished business before the Spring Festival. During that time it’s very common to see characters „春” („spring”) and „福” („good fortune”) displayed upside-down on the streets. This tradition originates from the identical pronunciation of the words „upside-down” and „arrive” in the Chinese language. The upside-down characters should be read as „spring arrives” or „good fortune arrives”. 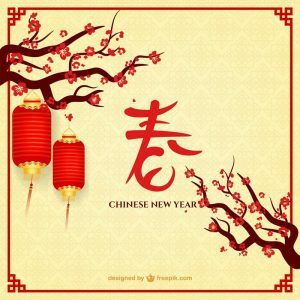 How do the Chinese celebrate Chinese New Year 2019? Spring Festival is the time when the Chinese come back to their hometowns for family reunions. They often travel thousands of kilometers to see their relatives. On the Chinese New Year’s Eve, the whole family gathers for a festive meal. The most important Spring Festival food is jiaozi dumplings (饺子). On the New Year’s table you will also find fish because in Chinese words „fish” (yu) and „surplus” are homonyms. Eating fish during Spring Festival is a wish to have some extra money or anything else a person might need in the new year. At midnight, the Chinese set off firecrackers and fireworks. According to the traditional Chinese beliefs, they are supposed to scare away the evil spirits. Chinese New Year is celebrated in a very joyful atmosphere. Relatives and friends enjoy time spent together over the reunion dinner, play games, dance and watch New Year’s TV Gala. The Chinese visit relatives and friends, greeting each other with the wishes of happiness and wealth. The exchange of gifts such as fruits or cakes is also a very common tradition. Parents and grandparents give children so-called hongbao (红包), red envelopes with money that are believed to attract wealth and blessings to the receivers. Unmarried young people also receive hongbao with the wishes of getting married soon. In China, a pig is perceived as an animal which brings wealth and good fortune. For this reason, some of the Chinese deliberately plan the birth of their child in the year of the Pig. The traits of people born under this Zodiac sign generally are courage, honesty, and enthusiasm. They enjoy company and are very loyal friends. When they set their mind to do something, they put all of their energy into that and don’t give up even when encountering obstacles. Zodiac Pigs are respected for not complicating simple matters and always being capable of reaching their goals. However, sincerity and selflessness make Pigs too trusting, therefore they need to be careful not to get fooled. People born in years of an Earth Pig (1959, 2019) are communicative, outgoing and know how to manage their time well. Famous people born in the year of the Pig include Marie Antoinette, Wolfgang Amadeus Mozart, Henry Ford, Alfred Hitchcock, Ronald Reagan, Woody Allen and Arnold Schwarzenegger. 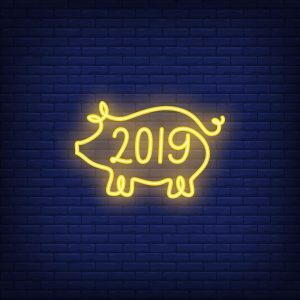 If you were born under the Pig zodiac, you need to remember to wear red clothes or accessories throughout Chinese New Year 2019 – the year of the Pig. According to Chinese beliefs, people in the zodiac year corresponding to their birth year are exposed to bad luck. Red is the lucky color in Chinese culture that symbolizes prosperity and success, as well as has a power of driving out misfortune. That’s why wearing red elements can bring blessings and a promise of the good year to people born under this year’s zodiac. Chinese New Year 2019 is the most important holiday in China. 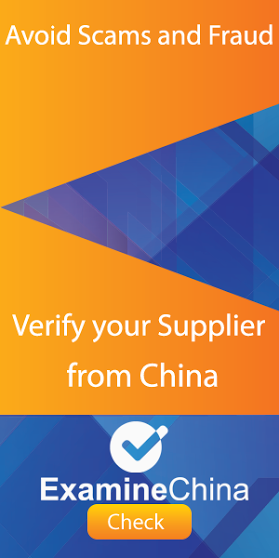 If you import from China, you also need to take other Chinese public holidays into consideration. See our list of China Holidays 2019.